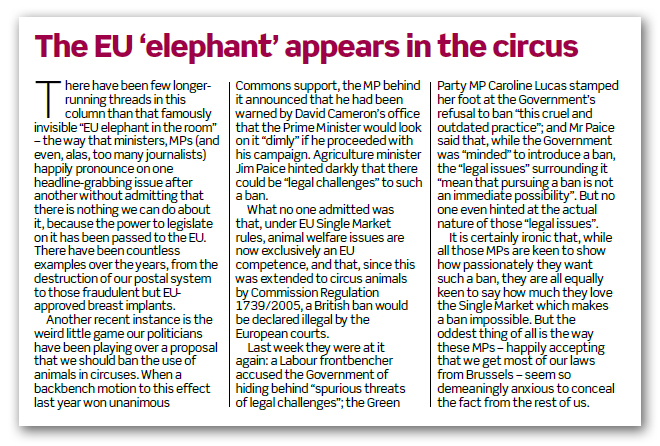 Following up on my earlier piece on circuses, Booker today notes that there have been few longer-running threads in his column than that famously invisible "EU elephant in the room". This is the way that ministers, MPs (and even, alas, too many journalists – says Booker) fail to admit or explain that some controversial policy or law stems not from our own government but from "Europe" and we are therefore powerless to change it. There have been countless examples over the years, from the destruction of our postal system to those fraudulent but EU-approved breast implants. This, in my view, is an extremely important phenomenon: people are being deliberately shielded from the impacts of our supreme government in Brussels, to which our provincial government is increasingly subordinated. Interestingly, though, the circus example, although one of the more egregious examples, evoked absolutely no comment on our forum, and very little in the comments to Booker's own comments, which long seem to have been hijacked by a bunch of obsessive climateers – with only a couple of comments on the circus piece. Despite that, the circus issue is special, not least because the indications are that the government set out deliberately to deceive. And newspapers such as the Daily Wail seem to have bought the spin, announcing that the government was intending to ban circus animals. On in later versions of the story in The Independent did it emerge that the government had made no commitment to a ban, simply leaving it as a vague aspiration, with no firm date offered for when a ban would be implemented. Cameron was thus accused of deploying "smoke and mirrors" to avoid imposing an immediate ban on wild animals in travelling circuses (above), while Tory MP Mark Pritchard, who had been leading the campaign for a ban dismissed the announcement as "disingenuous". "Without a proper commitment to legislation in this Parliament", he said, "any claim to be listening to the will of Parliament is meaningless. This is a classic smoke-and-mirrors tactic by Number 10. Meantime animals continue to suffer". Not once did any of the reporters, the government, nor in any of the published comments, was the EU dimension mentioned, although – as Witterings from Witney observes – EU activity continues apace. 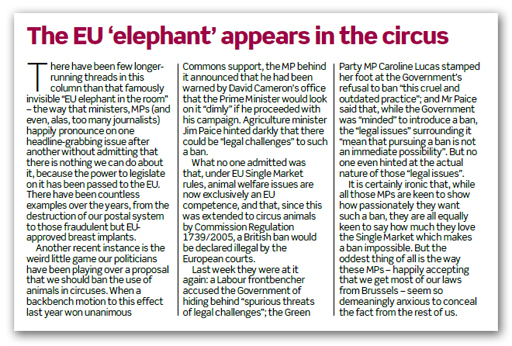 In this affair, a possible explanation is that animal welfare is a highly emotive subject, and the fact that the UK is being prevented from adopting a ban is potentially very damaging to the EU, hence the reluctance to publicise the EU role. Even the Commission seems wary of admitting its role, forcing the EU Ombudsman to take a hand. All the same, one really does wonder whether ministers are fully informed. In this case, we are dealing with Defra minister Jim Paice. He is not exactly famed for his intellectual accomplishment, to the extent that some have thought to applaud him when he successfully strings together three words to make a sentence without civil service help. But we are now told that Hilton has been driven out by Europe, after becoming "increasingly frustrated" by the slow progress of the battle against red tape and the endless meddling of Europe in British politics. As an aside, it is very easy to be "imaginative" in terms of policy ideas, if one has little or no idea of how government works, or the constraints upon it, but if Cameron's top aide is seemingly unaware of them, then the idea of government ministers being equally unaware is not that untoward. Thus, even now the question of whether ministers are deliberately setting out to deceive, or are just pig-ignorant, remains an open question. I tend towards favouring the latter, but you can never be sure.